Blooming is not always related to how the roses are fed and watered. Indeed roses love their water and do need some good "well balanced" nutrition. I recommend finding a good organic or organic based fertilizer for your roses. Take a look at the Epsoma brand fertilizers. See what organic ornamental or rose foods are available in your area. Look at giving all your rosebushes a cup of Kelp meal twice a year too, they love kelp meal. Building up the soils home of our rosebushes will make for a noticeable change in what we see top side. I also make sure to check the Ph of the soils. If the Ph is out of whack, available nutrients can be locked up in the soils and not available for the root system to take up. Check the nitrogen level of the fertilizer or food you have been using. Some of the supposed Bloom Booster items on the market actually are very high in nitrogen. Those will tend to increase foliage production while actually reducing the bloom production of the rosebush. 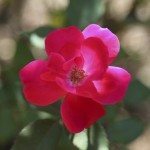 I hope this helps you and enjoy your roses!